Win a Michael Strahan Signed Football and More from Vaseline MEN! Wowee! 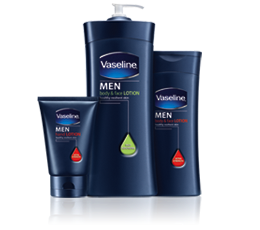 Father's Day is almost here, and while it may be too late to order anything personalized from online, it's not too late to check out Vaseline's newest line of products for men -- that you can pick up from the drugstore or retailer of your choice in time for the big day! 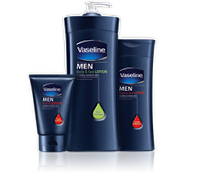 We're talking Vaseline MEN Body Lotions, a wonderfully-scented line of skin care treats designed specifically for Dad. They go on easily, smell awesome, and are totally lightweight. My husband loved trying out the Vaseline MEN Cooling Hydration Body Lotion, which absorbs in 15 seconds, and keeps his skin cool throughout his hot work days with a touch of menthol. Since men rarely pamper themselves, this lotion is an easy way to say "I care about you!" Vaseline is hosting a "Train with Michael Strahan Sweepstakes", where you can enter your dad to win a trip for 2 to L.A. for a one-on-one workout sessions with Michael. Find out all about this promotion at www.strongerskin.com. Want another chance to Win? To celebrate the launch of this nifty skin treat, we're giving away a signed Michael Strahan football, G-shock stop watch, and Vaseline MEN products to one lucky winner! To be entered to win, just comment on this post with how you let your man (or dad) know that you love him! You have until June 30th at 11:59 am CST to get your entries in. One per person please! * Sample was received to facilitate this promotion. All opinions are my own. Food really is the way to a man's heart -- especially dessert :) *Thanks* for the giveaway! Food usually works around here! I usually try to cook some thing every night so when he comes home from work there is something to eat. I show dad I love him by leaving flowers on his grave. Thanks for the chance, cool giveaway! I show my dad I love him by getting together with him and my sister often. By leaving cute little notes in different places such as lunch box, car windshield, or mirrors. By helping my Dad with the chores around the house. My man and I dont see each other much cause our schedules are so different so we like to leave cute notes for each other around the house! Good food and fun family times together let my husband know I love him. I let my husband know I love him by slipping little love notes in his pockets, shoes, food, etc. lol! Every fathers day I mow his lawn for him and give him a home depot gift card. By calling him often and letting him know by cooking his favorite deserts. I do everything a good wife does! I cook him breakfast his favorite meal of the day and I hate cooking early in the morning, so he knows I must love him. I make hubby Breakfast every Sunday. I leave him quotes from love poems everyday on his side of the bathroom where his sink is. i leave little notes in his car. I let him watch his baseball & football games with his buddies - even make up snacks for them. I rub his back and feet after he has a rough day at work. I make sure his favorite beer is iced down when he gets home. I tell him I love him often! In the morning when we're getting ready for work - or with a quick text - or with an email just to tell him how terrific he is! I tell him each and every day. I also take good care of him. I take care of my sweet Hubs by being his help-mate when needed and his heart-mate ALWAYS, he's a fantastic guy! I let him know by making his favorite meals. My husband and I are very affectionate people. So he gets lots of hugs, kisses and "I love you" daily. He definitely knows that he is my husband, best friend and lover. Cooking his favorite meals and desserts usually makes him feel loved. I tell him I love him ALL the time. I also show him I love him by doing his "prep" work every day, like laying out his clothes, so he doesn't have to stress. I love to cook for my dad and my hubby, that's how I show that I love them. I let him know by telling, and doing little things for him throughout the week. I fix him his favorite foods and good lunches to take to work. I also do little things like rub his back or rub his feet with lotion. I also tell him several times a day. Call him and share his interests. I let my dad and husband both know I love them by telling them so, often. By not complaining when things that are not his fault go wrong; and trying to overlook the things that go wrong that ARE his fault! I thank him for all the good things he does and for all his hard work. The way to hubbies heart is threw his mouth. He loves to eat so I make him great food. My father and I meet for breakfast at least once a week to stay in touch. I let my hubby know I love him by caring for his children, cooking his dinner, watching his silly horror movies with him, and rubbing his feet! I support his dreams and am sure to tell him I love him daily. Thanks for the giveaway...my Dad is in a nursing home so I have lunch with him once during the week, and I spend an afternoon with him on the weekends...and I talk with him every day on the phone. I show my dad that i love him, by calling him every week on the same day, like clockwork for the past 18 years . Although I live quite a ways away from my dad, I call home at least weekly and be sure to let him know I still appreciate his knowledge and opinions. I constantly tell him how much I love him. And I try to let him have a little quiet time when he comes home from work. If he sleeps in I take his car and fill the tank and get an inside and outside wash; now that tells a man you love him without saying! I make his favorite meals and do what I can for him since he works so much. i let my husband know that I love him by doing all i can to make him happy. he and i both spoil each other. we are best friends. i always encourage him and let him know that i am thankful to have him. I let both my dad and my man know I love them by my actions and I tell them "I love you" every day. let my hubby know by taking care of him,telling him what he means to me tooo! I let him know I love him by giving him a hug and kiss everyday. By giving him a hug. I think it is important to spend 1x1 time with him! Never part or hang up without saying "I love you!" I show him everyday by telling him I love him and doing whatever I can to make his life easier. I take care of him and tell him everyday how much I love him. I let my husband know I love him by caring for him and our children to the best I possibly can.